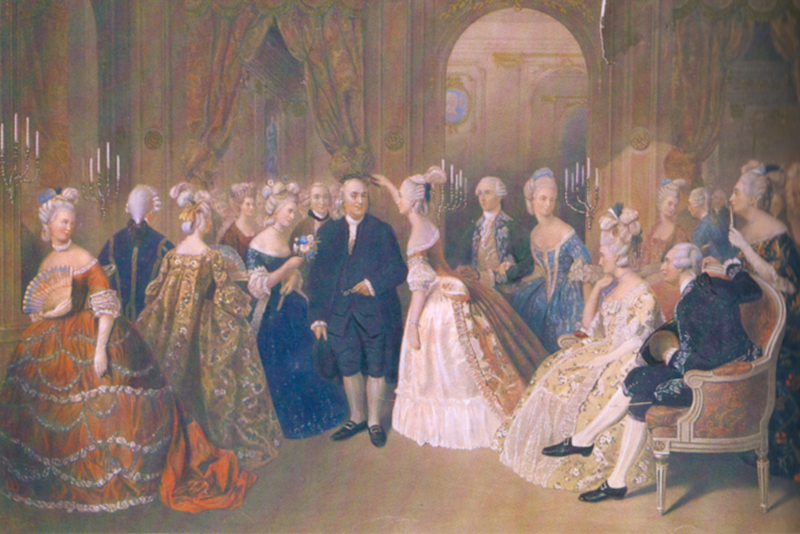 Benjamin Franklin surrounded by the ladies of the French court. Image courtesy of Wikimedia Commons. In the midst of the American Revolution, Benjamin Franklin envisioned the turkey as an exemplar of the ideal American citizen. In a 1783 letter home to his daughter Sally, written while Franklin was serving as chief diplomat to France, he wrote about the “ribbons and medals” presented to the French by grateful Americans in thanks for significant military and financial support. The tokens bore an image of an eagle—but, Franklin explained, some recipients complained that the workmanship was not up to sophisticated French standards. They thought that the eagle looked more like a turkey. Franklin asserted that this plucky fowl would have been a better choice in the first place. Eagles were found in many countries, but the turkey was an American native and “a bird of courage,” a fitting symbol of America’s valor and virtues. It “would not hesitate to attack a grenadier of the British Guard who should presume to invade his farm yard with a red coat on,” he wrote to Sally. Turkeys were tasty, too, Franklin further explained to her, first brought to France by the Jesuits and served to citizens of note including “at the Wedding Table of Charles the ninth,” in 1570. Some 200 years later, Franklin had served turkey to guests of his own in Philadelphia, and now the sumptuous fowl were often on his diplomatic table in Passy, France. Ever practical, Benjamin “Waste not, want not” Franklin clearly appreciated that a bird of taste and courage could nourish both the body and spirit of the nation. I write about food, using it as an interpretive tool to understand history and historical figures, so I was delighted to see that Benjamin Franklin liked writing about the topic as well, in his letters and political articles. Franklin realized the impact that foods—particularly, native foods—had in building the identity of a new nation. By the time he wrote that letter to his daughter praising the courage of turkeys, Franklin had pondered and promoted the idea of an American identity for more than 40 years, first as a loyal colonist, later as an emerging patriot, and then as one of the nation’s founders. He championed the things that set his homeland apart from its English and European heritage. 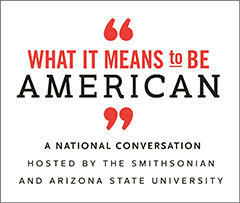 Out of his ponderings he would come to define the essential American persona and the ingredients of American success. American geography and its bounty, including its food, were central to the recipe. Throughout his political and diplomatic career—including 26 years spent in England and France, before and during the American Revolution—Franklin worked hard to convey the strengths of the American setting and the American character. He became a celebrity when he lived near Paris from 1776 to 1785, his image adorning all manner of objects. People felt as though they knew him personally, and he would happily answer their questions about America. Products of the land fit easily into Franklin’s vision of American industriousness and greatness. When he lived in London and worked as an agent for the Pennsylvania Colony, in two postings between 1757 and 1775, his wife Deborah sent him a wide variety of his favorite American foods: smoked wild venison, home-cured hams, and dried peaches—he preferred those dried without the peel. She sent kegs of cranberries, which caused great wonder among Franklin’s landlady’s kitchen staff. Deborah shipped barrels of her husband’s favorite Newtown Pippin apples, an American native variety famed for its superior keeping qualities. She sent grafted trees for planting on Franklin’s friends’ estates, symbols of the productive exchange of ideas and commerce he sought to encourage between the Colonies and the Crown. Out of his ponderings [Franklin] would come to define the essential American persona and the ingredients of American success. American geography and its bounty, including its food, were central to the recipe. Benjamin Franklin often considered the essence of his homeland from afar, especially as the 1760s brought the disintegration of the mutually supportive and respectful relationship between England and its American Colonies, which he and other patriots had sought to cultivate. In 1764, during the height of the Stamp Act controversy, Franklin, then living in London, wrote several letters to the editor using pen names such as “Homespun” to make the case for the Colonies. Again, his thoughts turned to corn. He employed it as a metaphor to dramatize the differences between the dynamic, diverse American settlements and the staid English homeland. In one essay published in several London newspapers in early January 1764, Franklin contrasted the essential American grain’s virtuosity and variety with the limitations of lowly English wheat. “[Maize] is one of the most agreeable and wholesome grains in the world; that its green ears roasted are a delicacy beyond expression; that samp, hominy, succatash, and nocake, made of it, are so many pleasing varieties; and that a johny or hoecake, hot from the fire, is better than a Yorkshire muffin.” Franklin continued saying that British essay writers who preferred “the roast beef of Old England” and condemned corn as “disagreeable” and “indigestible” without even tasting it, suffered from a misguided sense of superiority. He saw their snobbery as a metaphorical parallel to the Crown’s (faulty) assumption that it understood American people and possibilities, and thus knew best how to rule the colonies. The first shots of the Revolution were at the battle of Lexington and Concord in April 1775, and in June and July of 1776 members of the Continental Congress wrote and signed the Declaration of Independence, with its aspirations to “life, liberty, and the pursuit of happiness”—truths that were, in the word Benjamin Franklin himself wrote into that founding document, “self-evident.” Franklin would spend the next 10 years in France promoting American freedom and possibilities. Franklin cautioned that America’s streets were not paved with gold. But, he might also have added, the new nation’s fields and orchards were indeed filled with delicious turkeys, exceptional apples, and golden grains of opportunity. Rae Katherine Eighmey is an author and cook who lives in Iowa. Her newest book is Stirring the Pot with Benjamin Franklin: A Founding Father’s Culinary Adventures, published by Smithsonian Books. Primary Editor: Eryn Brown | Secondary Editor: Reed Johnson.